The only remains of this furnace is the sign posted along the road. I spoke with several members of the local community and all agreed that the furnace site had been torn down many years ago. 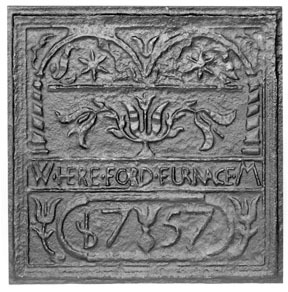 I found the picture of fireback plate at www.fireback.com According to several sources, this furnace and the related Green Lane Forge produced the first cast iron stove in North America. The following information was obtained from Rootsweb. We believe that Thomas Maybury was born about 1692 in Herefordshire, England and that he came to Massachusetts by 1717. By 1734 he had located in what is now Marlborough Township in Montgomery County, Pennsylvania. Presumably he is the same Thomas Maybery who was granted 10 acres in 1716 in Newton townstead in Bucks County. He also made a payment for land in the "Perkiomen Country" in 1739. It is known that he purchased 1000 acres of land in October 1742 and received a patent for another 1230 acres in December of the same year. On this land Thomas Maybury, known as "the ironmaster", established the Green Lane Forge and the Hereford Furnace. Thomas Maybury's wife was Sophia Rutter. Among the early Pennsylvania Mayburys closely associated with him are several who are a few years too old to have been his children. Therefore, it seems likely that he may have had one or more brothers who came to America with him. Records of the Jolly family refer to the Mayberrys (sic) as having come to Pennsylvania from New Jersey. However, this probably derives from the fact that Thomas Maybury, Jr. (know as "the elder") is known to to have set up a foundry at Mt. Holly, New Jersey, a short distance from Philadelphia. When Thomas Maybury died on 2 March 1747, ownership of the forge fell to his heirs until his oldest son, William, took it over in 1757 and managed it until his own death in 1764. The forge then remained in William's family until his brother, Thomas Maybury, took it over and ran it from 1784 to 1797. During the Revolutionary War the forges provided cannon balls and wrought iron to the Continental Army. 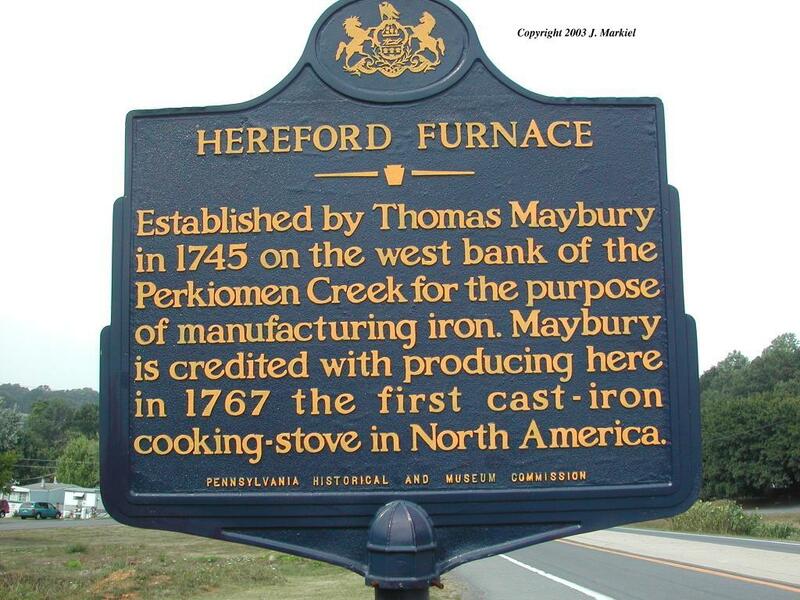 The Hereford Furnace operated from 1734-1768 and produced the first ten plate cook stove with oven made in America. Green Lane Forge remained in the Maybury family until it was sold in 1814. Located on Pennsylvania 100/29 east in Hereford, at the intersection with Rt 1010.